If you see this model walk away from it, as it is evil. If somebody gives you this model they are not your friend. This model will destroy your weekend. The Glencoe 1/48 model of the Jupiter “C” is a reissue of the Hawk kit, first released in 1959. In fact some of the old Hawk markings are still found on the interior of some parts. The kit contains thirty two parts, with some surprisingly good detail, molded in light gray styrene. A launch pad is provided to use as a stand. The decals are from Scale Master. The major problem with this model is that the molds are old and very warped. The four pieces that make up the body of the rocket are extremely warped and cannot be assembled. I tried every trick I knew to straighten them, bending in hot water, sectional gluing using clamps and super glue, nothing worked. I realized that these pieces had to be replaced with some sort of tube if the model was to be completed. The parts had a diameter of one and one half inches which scaled perfectly to the six foot diameter of the real Jupiter “C”. Now where to find a tube? The tube was found at Lowes, in the form of a twelve inch long PVC tail stock for a kitchen drain with a diameter of one and one half inches. It cost $1.49. With my tube in hand I could continue with the build. The aft portion of the original body parts that contained the fins, exhaust and exhaust vanes were cut away from the warped section as was the guidance section from the upper body portions. The original nose cone was glued to the cut upper guidance section for more strength. The central section was replaced by the PVC tube, cut to the proper length. By the way all this cutting was done on a band saw, first time I ever used that large of a tool on a model. The build went fairly easy after that, with the upper and lower sections of the kit being super glued to the new PVC central section. The fins and their associated exhaust vanes for the lower section went on without problem. A little filler, some sanding, and I was ready to paint. The model is done in overall Krylon gloss white with Tamiya X-1 gloss black for the black identification panels on the lower section. The Scale Master decals went on with no problem and the entire model is coated in Krylon gloss. Here’s an interesting thing concerning the markings. 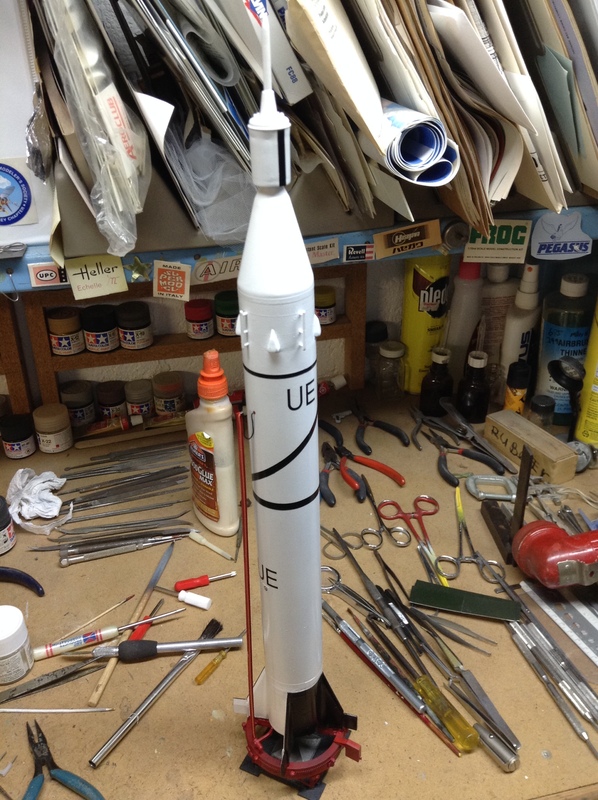 Do you know what the “UE” means on the side of the rocket? It’s a code for the serial number of the rocket. A numerical value was given to the letters in the name “Huntsville” where the rocket was designed. The second “L” in Huntsville was not used. An example would be “UI” which was serial number 27, “UE” being 29. We had to keep the Russians guessing in 1959 ! 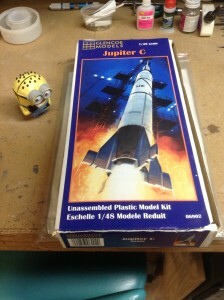 To complete the model I had to build the launch pad which is used as a stand. Looked like a piece of cake. WRONG. The rings which form the majority of the launch pad were warped. At this point I used brute force and much super glue to get the thing straight. If that pad is ever dropped the flying pieces will be dangerous! The pad was finished off in Tamiya XF-7 red with black pastel used for exhaust staining. The exhaust deflector is Tamiya XF-56 metallic gray with Tamiya XF-1 for the surrounding structure. A launch arm containing the electrical supply and umbilical cable was made from Evergreen “H” stock and floral wire to add a little interest. The model is big, nineteen inches high mounted on its launching pad and does not look bad at a distance. Don’t get too close as the launch pad might spring apart and get you! This was not a fun build, more of a relief that it’s over. However, I learned some new build techniques. In its day the original Hawk model was very good, it is sad that the molds have deteriorated to such an extent, and even sadder that Glencoe would sell such a defective product. But all is not bad with this model, like the original Hawk model you’ll get this nifty Jupiter “C” pin. Think I’ll use it as a tie tack for a wedding Deb and I are going to, it’s sure to impress her as well as the other guests.